O’Fallon | Beer Apprentice - Craft Beer News, Reviews, Interviews and Info. For today’s craft beer review I’m going to be trying the O’Fallon “Smoke” Smoked Porter brewed by the O’Fallon Brewery located in O’Fallon, Missouri. Let’s bypass all of the small talk and jump right into the commercial description from the website, ofallonbrewery.com. Dark, rich and smoky…this classic porter is brewed with 63% German smoked malt and makes a perfect after dinner (or anytime) sipper for those who love a “bigger” beer. Winner of the Gold Medal in the 2004 Great American Beer Festival® for best Smoked Beer in America! This brew has an ABV of 6.0% and it comes in a 12 oz. bottle. The beer appeared a very deep, dark, brown to black color with a small outline of ruby at the bottom of the glass. The collar was tan in color, full sized, smooth, creamy and soft. The retention time was decent enough, however the lacing was only “so-so”. The nose brought forth a pretty nice punch of smoke. It smelled reminiscent of fried bacon fat and country ham. The malts were well roasted and toasted and I gathered a light sweetness from some chocolate aspects. Deeper into the aroma I discovered a delicate woody tone with impressions of buttermilk and an herbal reference. Not bad. The taste revealed reminders of the smoke by way of smoked pork. Further aspects of chocolate and whole milk were found. Like the aroma, it was well roasted and toasted. Honestly, the taste didn’t seem all that complex or complicated. It was fairly straight forward for the style. Not that it’s a bad thing because sometimes I just want a flavor that is to the point. It tasted pretty good actually. It was well balanced and even. The mouthfeel was medium, smooth, dry, slick, creamy and chewy. As I got a little closer to finishing the glass I noticed that it started to thin just a little bit. Other than that, it left a modest showing of flavor on the palate after the swallow. You know, I really like this style of beer. I totally respect and enjoy the aroma and taste of these beers, however the drinkability factor has never been that high for me. One is about all I can withstand on any given night. I will say that if you favor the style, don’t pass on the O’Fallon “Smoke” Smoked Porter because it is a very proper beer with plenty of that smokey goodness. Personally, I don’t think this brew is quite on par with the Schlenkerla efforts, but it still has a sufficient amount of merit. So, pick it up…. give it a taste…. and let me know what you thought of the O’Fallon “Smoke” Smoked Porter. Thanks for reading and commenting guys. I really appreciate it. Until next time. Hello again guys. Thanks for checking in for another craft beer review. Today, I’m going to be trying another brew from the O’Fallon Brewery located in O’Fallon, Missouri called the Hemp Hop Rye Amber Ale. O’Fallon tends to make some pretty decent beers and I had never heard of this brew before, so I figured it couldn’t hurt to give it a try. The website, ofallonbrewery.com, didn’t have a description of the Hemp Hop Rye Amber Ale, so I copied the commercial description from ratebeer.com. That’s right, there’s hemp in this smooth, polished amber ale. To be specific, we use hemp seed – one of the oldest and healthiest of ingredients – to create a subtle toasted nutty flavor that compliments the hops (a botanical cousin to hemp) and rye. We use Cara Rye and Malted Rye for a subtle spiciness and rich ruby color and Victory Malt to tie together the flavors with a nuttiness that compliments the hemp seed flavor. German Hallertauer hops add seasoning and we finish with Cascade hops for a crisp citrus aroma and taste. This wide assortment of flavors harmonize, creating a uniquely smooth and flavorful beer! Enjoy! This brew has an ABV of 5.5% and it comes in a 12 oz. bottle. It poured a cloudy, amber color with some burnt yellow highlights at the bottom of the glass. An off white, creamy, smooth head was formed from a medium aggressive pour. It wasn’t very large, the retention time was just “ok” and the lacing seemed to fall back into the liquid fairly quickly after forceful swirls. The bouquet had a very “earthy”, “herbal” hop profile. Sweet caramel malts with a slight hint of toasted nuttiness enveloped the nose. Small hints of rye bread were definitely noticed along with a mild hint of butter. Overall, it seemed to be balanced and harmonized very well. This aroma wasn’t too bad really. It wasn’t particularly robust, although enough character was present to keep me interested. With the first sip I received the breadiness, however it seemed to lean a little more towards wheat bread than rye bread. I don’t know, it could have just been my ignorance of interpretation. Again, a smattering of the caramel sweetness showed itself along with the very “earthy”, “herbal” hop presence. Some bitterness was noted, however it was not overdone or out of character with the subtle hop character. A light, toasty savor was found as well as a very pleasant apple butter taste. Something similar to apple butter spread that one may receive on biscuits. Very nice I thought. I never really discerned any citrus or anything though. The mouthfeel was a sturdy medium. It was smooth, dry and a little bit chewy. An honorable amount of flavor was left behind on the palate for me to enjoy between sips. I think we have ourselves a pretty good beer right here. I found it to be very enjoyable. It’s solid all around. An honest and respectable aroma, taste and mouthfeel kept my attention throughout the entire drinking experience. It made for an excellent companion on this crisp Fall evening. It’s completely sessionable and worth a try if you happen upon it. I would have no problem sipping on this brew again. 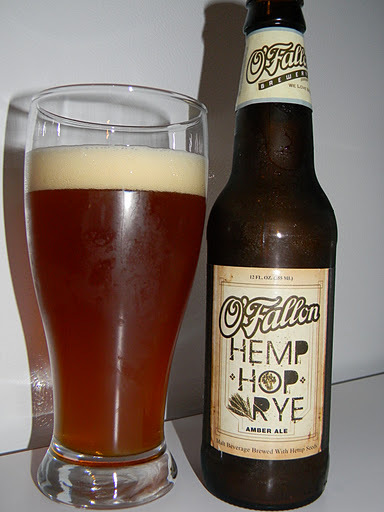 So, if you have the opportunity to try the O’Fallon Hemp Hop Rye Amber Ale…. do it, and let me know what you thought of it. I would like to hear about your experience. Thanks for reading and commenting folks. Until next time. Hello again folks. Today I thought I would keep in spirit with the season and review a pumpkin beer. 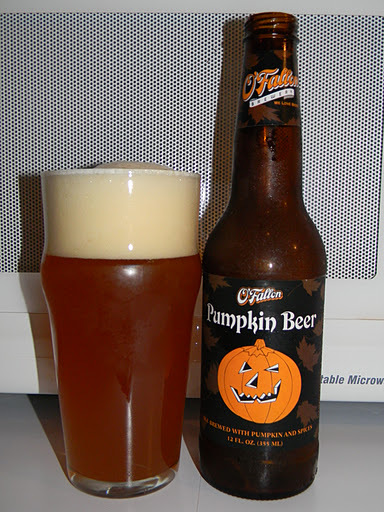 How about the O’Fallon Pumpkin Beer produced by the O’Fallon Brewery located in O’Fallon, Missouri? I have only had a few beers from this brewery and I have yet to try their pumpkin brew, so I’m looking forward to giving this thing a test drive. The website, ofallonbrewery.com, had this to say about their seasonal beer. Like pumpkin pie in a bottle… we add 136 pounds of real pumpkin to the three-barley mash and then season the finished beer with cinnamon, nutmeg and cloves. Available September 1. Let’s see how it stands up. This beer has an ABV of 5.6% and it comes in a 12 oz. bottle. The appearance was a very hazy, orange color with some burnt yellow highlights hugging the bottom and sides of the glass. The crown was off white, mostly smooth and slightly creamy. It was very well sized with pretty good retention and some ok lacing. After the head settled it was no problem to regenerate some foam with just a few swirls. I love doing that. The aroma started with the pumpkin of course, but I also found nice wafts of cinnamon, brown sugar and spices of ginger and clove. A delicate breadiness was found that, when combined with the pumpkin and brown sugar, reminded me of my Mother’s freshly baked pumpkin bread. Nice and well balanced. The taste brings the pumpkin to the forefront at first. It’s then followed by some of the nutmeg and the brown sugar/cinnamon combination. I even thought I was sensing a touch of caramel. The taste was sweet, but it wasn’t overly sweet. Just about right really. The spices were noticed, but the brew was not over spiced like a lot of pumpkin beers can be. Just a nice little dose to give it a touch more character. More of the breadiness was tasted also, which give it a well rounded and smoother flavor. I didn’t really notice much in the hops department with this one however. The mouthfeel was medium, smooth and somewhat crisp. It’s not real dry though. It’s not watery either, but it kind of sat in the middle. The palate was not left with a great amount of flavor. It vanished a little quicker than I was hoping. Well, I thought this was a nice little pumpkin beer. It fits and follows the style very well. It had plenty of spice and pumpkin flavor so as not to let me forget what I was drinking. It was easily drinkable and enjoyable too. I, personally, don’t think that I could make any “pumpkin” beer my primary beer for an evening, however I could have a couple of these at one time and be quite happy. I think it’s definitely worth a go if you are looking to try a few different Fall seasonals. I’ll remember to pick this up again next year and enjoy it as I sit on my porch and watch the leaves turn. What brewery do you guys think makes the best pumpkin beer? Feel free to leave a comment if you wish.